Thunderfist by NetEnt is a game, which has taken the world of online slot machine casino games by storm when NetEnt announced it will be based on the theme of orient martial arts. This is one such theme, where previously not many games or developers have worked or designed before. The game however does not go too lavishly by giving higher payouts, and as a matter of fact, the payouts are very nominal. A gamer can play free Thunderfist casino slot machine game in numerous casinos and this requires absolutely no download or registration. Autoplay feature allows the player to stay hands free from spinning the reels every time and let the slot work automatically. Max Bet option allows the players to set among the bet ranges and allows putting the maximum bet. The maximum bet value option can be adjusted in the “bet” option. Win: The winnings or amounts will be displayed. The game consists of 5 reels and a large 243 winning ways. Although in practice, the game does not contain fixed 1-5 paylines and the winning combinations are formed of the similar symbols from 3 to 5. These are situated at the neighbor reels starting from left side. 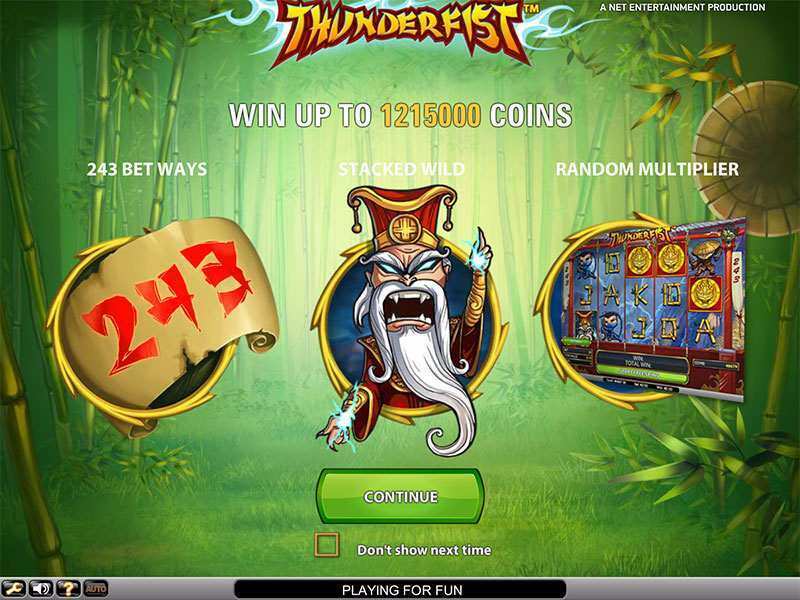 Thunderfist online slot machine game alongside contains some useful features and symbols in the slot. There is one gambling feature, which doubles the total payoff and this feature comes to relevance while playing for a longer duration of time. The game contains a wonderful RTP rate of 96.7% and ensures the players of a win almost on all occasions. Thunderfist slot is a game based on martial arts and the characters are thus, showed in the same pattern. Even the card values from 10 to ace shows bamboo signs and with a fighter in the background. Scatter symbol: Scatters in the game is denoted by a golden hong with an image of dragon. Wild Symbol: Wilds are denoted by a white haired master that has superpower properties. Wilds tend to appear anywhere in the reel and does not form any combination of its own. Like most of the modern day slot machine games, Wilds just acts as a substitute or trump over other lower valued symbols (scatters being the exception) and replaces them to form a winning combinations. Scatters on the other hand acts as a free spin/ multiplier enhancer. On landing three or more scatters out at any position on the reels, the player stands a chance to score 10, 15 or 20 free spins during the time when an extra multiplier, which ranges from 2X to 25X, is on effect. Thus, the game precedes one by the current bets. No Progressive bonus is available in the casino game and so does gambling features too isn’t available. Plus, no separate bonus features or jackpot games are available either. Thunderfist by NetEnt gaming is one of the famous online slot machine games, which is based on the models of orient martial arts. This is an entirely new genre of gaming and the theme is widely appreciated by a lot of players across the world. The game does not come up with a lot to offer when it comes to payoff indexes, and the players should always keep this in mind. Having said all these, the game has takers across countries such as UK, where numerous casinos that supports games from NetEnt have confirmed about the popularity. The game can always be played for real money, and where the players can earn monetary benefits for real. Thus, Thunderfist slot is one slot machine game with modest payoffs but high variance of winnings. 0 responses to "Thunderfist Slot"